We’re here to help! The Library has some great HSC resources available for borrowing, quiet study spaces for those who need a change of scenery, and free access to Your Tutor. Available from Sunday to Friday, 3pm-10pm, Your Tutor is free, online help with homework and study. A tutor who specialises in the subject you need help with is on hand to help you work through any problems. Free for all library members. Call the Library on 63529100 for more information, or visit our website. Every Monday during school term at Lithgow Library we host Lego Club for kids aged 5 and over. Each week we have new build challenges during which we foster creative thinking and imaginative play. It’s great fun for the kids and parents alike! Bookings are required and can be made by contacting the Library on 63529100. Do you Pokemon? 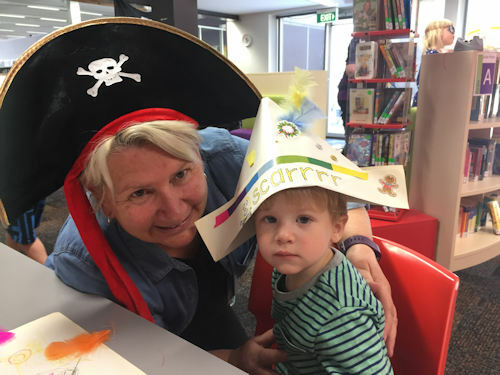 Every second Thursday during school term we do at Lithgow Library! 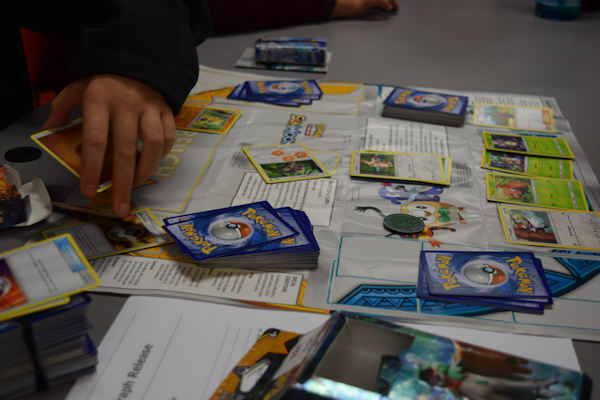 Bring along your cards and battle playing Pokemon TCG, from 4pm. Dates for Term 4 are Thursday 12/10, 26/10, 9/11, 23/11 and 7/12 from 4pm. Each player must have their own cards, parent supervision required for children under 12. No need to book, just come along and join the fun! Out By Angela may George and Owen Swan. By Angela may George and Owen Swan. As we celebrate International Peace Day on September 21st, it’s timely to remember the men, women and children who are seeking peace, safety and asylum. The story is told from the little girl’s point of view and is both heartbreaking and triumphant, allowing timely and sensitive discussion of what drives people to become refugees and the challenges they face. In ‘Out’a little girl flees her homeland, making a long and treacherous boat journey with her mother to seek asylum in Australia. Starting a new life is challenging, but they work hard to create a new home. This book was shortlisted for the Children’s Book of the Year awards in 2017 and is available for loan from the Lithgow Library Learning Centre. Lithgow Library celebrates history with display of photographs, collectables, vintage bicycles and bicycle racing memorabilia. Bicycling riding has been a popular recreation, transport and competition event in Australia since cycles arrived on our shores in the 1870s, reaching the peak of their popularity in the 1960s and 70s. On display at the library for September are four vintage bicycles, two belonging to Ian Rufus and two racing cycles plus racing memorabilia belonging to long term Lithgow cycling enthusiast Clive Laing. Also on display are some oversize images from the Local Studies photographic collection, including one that the library recently received a second original copy from a recent donation by the Lithgow Mercury, special because it has the entire group named on the reverse. Please join us for the library’s next speaker event on 28th September, 2017, with guests Clive Laing, Geri Stieda and Ian Rufus, and bring your cycling stories to share. A huge crowd gathered in the library this morning to celebrate International Day of Peace. Organised by Michelle Henry, the event included a range of speakers and beautiful musical performances. As part of the event, the library is host to an exhibition of bright and colourful artworks created by local school students, all themed around peace. Get ready for Halloween with a month of specially themed storytimes! Wednesday 4th October – Let’s Dress Up! Practice for Halloween by wearing your favourite costume. We will be reading “Book’o’Masks” and “The very cranky bear” and we will make ourselves a mask afterwards. Wednesday 11th October – Scared!! Today we will read “Can you make a scary face?” and “The terrible plop”. Wednesday 18th October – Monsters number 1! Let’s read about Monsters, and maybe get some ideas for Halloween. Lithgow Library is extending History Week into a Pop History Month in September 2017 with a display of vintage racing bicycles and racing memorabilia belonging to Clive Laing, vintage bicycles from the collection of Ian Rufus and a display of Pop Culture collectables belonging to library staff. Also to celebrate History Month there will be a speaker event and forum on Thursday 28th September 2017, from 10.30 to 11.30am, led by Gerri Laing, speaking about her family’s cycling history, and Ian Rufus speaking about his bicycles on display at the library. When we think of Pop Culture we think of the mid-20th Century mass media influenced fashion trends. One of the booms was that of the bicycle which had its biggest wave of popularity in the 60s and 70s. ‘Everyone will have a story about their childhood bike riding escapades’ said Mayor Stephen Lesslie, ‘come along to the library to hear the cycling tales of Clive and Gerri Laing, and Ian Rufus, and also to share your own bike riding tales’. Of special interest to local history lovers and cycling fans are a much repaired 1920s bicycle with a connection to Glen Davis, the world first portable, folding bicycle, and two racing bicycles from the 1980s. Bookings can be made to attend this free History Talk, which will include light refreshments, by contacting the Lithgow Library on 6352 9100. Lithgow Library, Thursday 28th September, 2017 at 10.30am.